The talks are Free and Open to the Public! We hope you will join us! Thursday, January 10, 2019 at 7 p.m.
Max Holmes is an earth systems scientist who studies rivers and their watersheds and how climate change and other disturbances are affecting the cycles of water and chemicals in the environment. 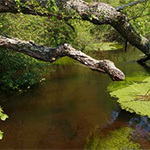 He has conducted work on rivers around the world, including in Russia, Alaska, the Amazon, and the Congo; these studies have informed how he thinks about rivers on Cape Cod. His talk will highlight the work of the Cape Cod Rivers Observatory (caperivers.org), which Max and colleagues began in 2016. With ongoing projects in the arctic and in the tropics, Max is committed to engaging students in his research projects and to communicating the results and implications of his research to the public and to policy-makers. Please join us to see how similar, and how different, our rivers on the Cape are from others around the world. Thursday, February 14, 2019 at 7 p.m.
fascinating. 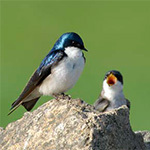 Bird specialist Mike Tucker will explore the general dynamics of bird pairs through their interesting courtship and territorial behaviors, taking a close look at several species and the unusual relationships they form. Mike’s involvement in the world of birds began more than 40 years ago with his first pair of binoculars. Over the last three decades, with career and volunteer work combined, his experience has ranged from field biology to education. He continues to share his passion for birds that includes leading birdwatching trips around the Northeast, giving talks and teaching workshops. Join us for Valentine’s Day to celebrate our love of birds! Thursday, March 14, 2019 at 7 p.m.
Jessica Donohue studies marine plastic debris, working with microplastics collected using surface plankton nets on board SEA’s sailing research vessels. 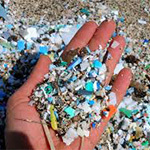 SEA has a 30-year dataset of marine plastic debris from the North Atlantic collected by SEA Semester students, faculty and crew, the largest dataset of its kind in the world. Using this dataset as a jumping off point, Jessica will discuss the very real global problem of plastic pollution in the marine environment, focusing on microplastics that float on the ocean’s surface. Hear about sampling and collecting data in the marine environment, and what we know about the sources and impacts of microplastics. Jessica will present some questions about marine plastics that remain unanswered, and will offer some possible solutions – including local initiatives to reduce our plastic footprint. Thursday, April 11, 2019 at 7 p.m. The area in and around Falmouth is home to over 100 species of edible wild plants, ranging from the mundane to the exotic, and includes dozens of species of edible wild mushrooms. 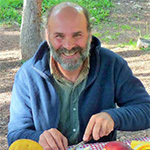 Join Russ Cohen, author of the book Wild Plants I Have Known…and Eaten, for a fascinating presentation covering at least three dozen of the tastiest species the region has to offer. These include species everyone knows well (Daisies and Dandelions), to species you may never have heard of (Calamus or Carrion Flower). Covering at least a dozen of the easier-to-recognize edible mushrooms, Russ will talk about how to identify these species, along with information about edible portions, seasons of availability, preparation methods, and guidelines for safe and environmentally-responsible foraging. Finally, he will discuss some native edible plants he has grown successfully from seed, and will share handouts and samples of foraged goodies made with wild ingredients.